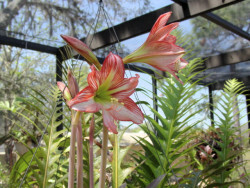 Amaryllis is native to South Africa and South America and through extensive hybridization has become a popular holiday pot plant all over the world. Amaryllis blossoms range from pure white and pink through dark maroon and any shaded or striped combination thereof. The plant produces basal straplike leaves from 1 to 2 feet tall. The flower stalk emerges from the center of the bulb usually at the same time or before the foliage appears. The individual blossom is shaped much like a lily but they are borne on a strong tubular stem with typically four and sometimes up to six flowers arranged in a cluster on the top. Typical flower size is 6 to 8 inches but can reach up to 12 inches across. Well into the active growing season, the strong, 2 to 4 inch broad leaves will sometimes bend at their center from sheer weight. Amaryllis need enriched, well drained soil and partial shade when planted in your garden. During the growing season, water moderately to keep soil moist but not saturated. Pinch off faded blossoms to avoid formation of seed pods. If you are in zone 9 and higher, you can leave the bulbs in the ground. However, it is beneficial to dig, sort and replant amaryllis bulbs each season after the foliage is gone and the tops of the bulbs look dry. Keep about a foot apart to allow foliage to develop. If you are in an area that receives frost, or you are growing your amaryllis in pots, wait until the leaves have withered, then dig and store the bulbs in an open bag or container loosely covered with dry sawdust or peat. Keep the stored bulbs in your garage or somewhere else where they will not be exposed to the weather. Replant in the ground in early spring when danger of frost is over. Space bulbs 10 to 12 inches apart. For houseplants, it is a good idea to stagger plantings in pots from October through February. Amaryllis will take 6 to 8 weeks from planting to bloom. Select a clay pot about 2 inches larger than the diameter of the bulb, or use a 10 to 12 inch pot to plant a group of three bulbs. Put some gravel in the bottom for drainage and to stabilize the pot. Use a good houseplant soil and mix in some osmocote or a very little amount (a tablespoon is plenty) of other dry fertilizer such as 6-6-6. Water thorougly and then don't water again until either the soil has become dry or you see some green emerging from the bulb. In either case, if your are planting or replanting amaryllis bulbs, leave the top 1/3 portion of the bulb exposed above the soil level. It is possible to propagate amaryllis from seed. Seedlings look much like grass when first emerging, foliage will increase only slightly in size and substance each season. It will take years before they are large enough to bloom. Well grown plants will produce bulblets. You can separate these from the original bulb and plant seperately. They should bloom within two years or less. You can also increase your collection by cutting larger bulbs in 2 or 4 pieces just prior to planting. If you see red streaks on the leaves of your amaryllis, chances are they have red blotch (stagnospora curtissi). This is a fungus disease which can easily be controlled by spraying foliage with neutral copper or a copper based fungicide.